Peony Gay Paree. From Kath’s Garden Plants display at the GWL show. Sumptuous colour. Of course, I ordered one from http://www.cathsgardenplants.co.uk. And brought home…. 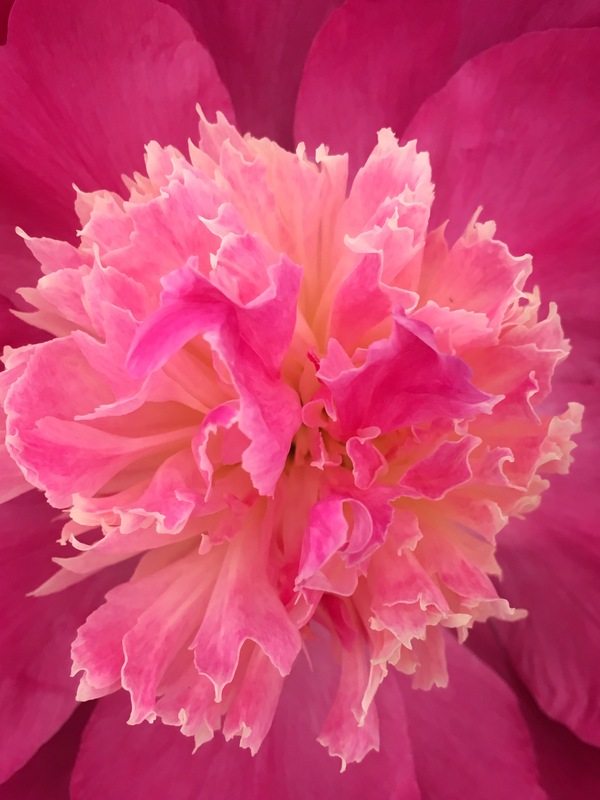 Peony Immaculee. Pure white double – and so scented. Dreamy. Photo tomorrow. No internet tonight. Who else is growing peonies? We grow them and love them when they are in their glory. Must try harder with the supporting regime, the winds have been terrible this year. My supports just stay there all year round. They are the Leander metal half moon type supports and I also wind round some willow and hazel circles. They are hopeless if left to flop. The slugs get in them and the rain finishes them. But propped up, mine have managed to shake off the rain. My white one called Shirley Temple copes with high winds and rain, fortunately. Thanks as always for reading and and for getting in touch, Brian. Much appreciated. I love them. They are so resilient. The Late snow nearly flattened them and the early heat is frying up the blossoms, but they carry on. I must learn from my peonies! Thanks for reading and getting in touch Cathy. I’m really enjoying the peonies this year. I took a huge basket of Sarah Bernhardt pink peonies into radio Leicester yesterday morning for the gardeners’ phone-in programme. The first question up was on peonies. Isn’t it. Bought the white double cream one too, but sadly no internet so can’t post any photos. Oh, the joys of living in the countryside….. sigh.